Continuously accused of being a silent prime minister during his ten-year reign, Manmohan Singh the other day insisted that the accusation was wrong, and that he regularly interacted with the media. Singh recalled that he had held press conferences, implying that his most talkative successor has not faced the media during his entire term. Prime Minister Narendra Modi’s reluctance was evident during a video conference with party workers in Tamil Nadu and Puducherry, when he was visibly upset by a critical question on the neglect of the middle class by a zealous tax-collecting government, and moved briskly on. No, Modi will not abandon video conferences with party workers in different states ahead of the Lok Sabha elections. But, the BJP machinery will now scrutinise those who want to participate; prospective participants must post a video asking the question—48 hours in advance. But, it is not just Modi who is reluctant to face rough questions. Media minders of both Atal Behari Vajpayee and Singh avoided situations where hostile questions could be fired. 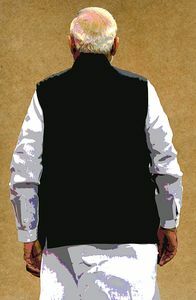 As Vajpayee showed signs of slowdown in his last two years, his protective family and bureaucracy ensured that he was not exposed to media questioning, lest he gives an off-hand answer. Similarly, Singh’s PMO was always looking over its shoulder for Congress president Sonia Gandhi’s reaction to statements made by the prime minister. Singh is right in saying that he freely interacted with the accompanying media delegation when he travelled abroad. In fact, his earth-shaking statement which put his government in crisis was made to journalists on the way to Japan in 2008 for a G-8 summit. This columnist had the opportunity to ask about the future of the India-US civil nuclear deal, and Singh categorically said India would approach the International Atomic Energy Agency soon to approve the deal. When the media reports reached Delhi, a furious CPI(M) general secretary Prakash Karat withdraw the support of left parties to the UPA government. But, Singh overcame the crisis as other friendly parties supported him, and he bagged a resounding election victory the next year. The external affairs ministry has become the most control-conscious wing of the government. When leaders of foreign governments held talks with the prime minister—from Vajpayee, Singh and now Modi—only two questions are permitted to Indian journalists, and there, too, the journalists and the questions are prescreened. Of course, when details of the talks get leaked either from the delegation of the foreign leader or from governmental sources, the ministry spends more time firefighting. Political leaders are claiming that social media has made them more accessible and answerable. But Modi has showed how Twitter can be used for one-way communication; Arun Jaitley does it with his blog. Normally, Janata parivar leaders like V.P. Singh, Chandra Shekhar, H.D. Deve Gowda and I.K. Gujral, who never had majority in Parliament, were more accessible to the media. The joke is that earlier the leaks used to happen from the top, while now the leaks are subterranean. It is for politicians to judge which is helpful or harmful.